Getting my stall ready – two days to go! I’ve been busy over the summer getting things made for a charity coffee & craft morning we are holding on Saturday. I have been stocking up my selection of handmade bags, pouches, purses and little bits and pieces like brooches, hair clips and so on. It’s in aid of the NICU (the Neonatal Intensive Care Unit) at the Norfolk & Norwich Hospital where my son Jack spent his first two weeks as a baby. The NICU is staffed by the most wonderful team of people – nurses, doctors and other staff – and they saved Jack’s life. When he was born following an emergency caesarian section, he had to be resuscitated for 7 minutes and then spent the first 3 days of his life in the NICU on a TOBY cooling mat. 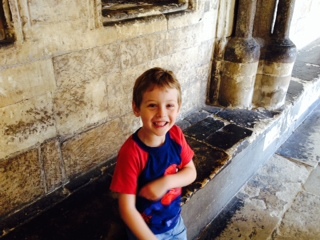 He is going to be 5 next week and is a bright, clever and energetic little boy. You would never know by looking at him that he had such a traumatic start to life, and we are eternally grateful to the amazing care that he received from the NICU. Last year we held a similar event and it was a lovely day, raising lots of cash for the NICU. So this year we have been busy again, my mum making lovely jewellery & jams, me my fabric bits and bobs, and we’ll also have other stalls (pre-loved clothes and books, homemade preserves, handmade cards and a tombola stall too). All alongside yummy cakes, bakes and cups of tea and coffee! My kitchen tomorrow should look like the set of Great British Bake Off, with any luck! Although no bin tantrums, I hope! Now, we just need a bit of sun, and lots of friends to show up with lots of pennies to spend! 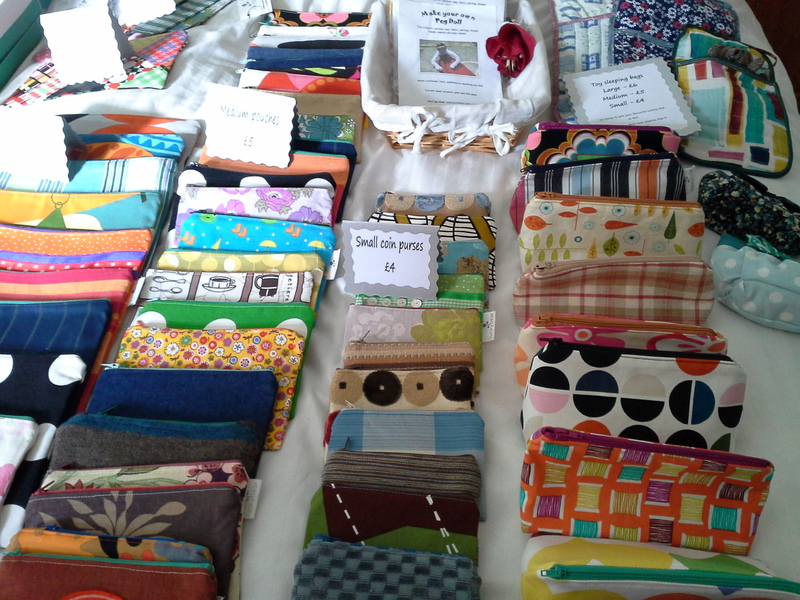 Lots of pouches, purses and iPad covers ready for sale. 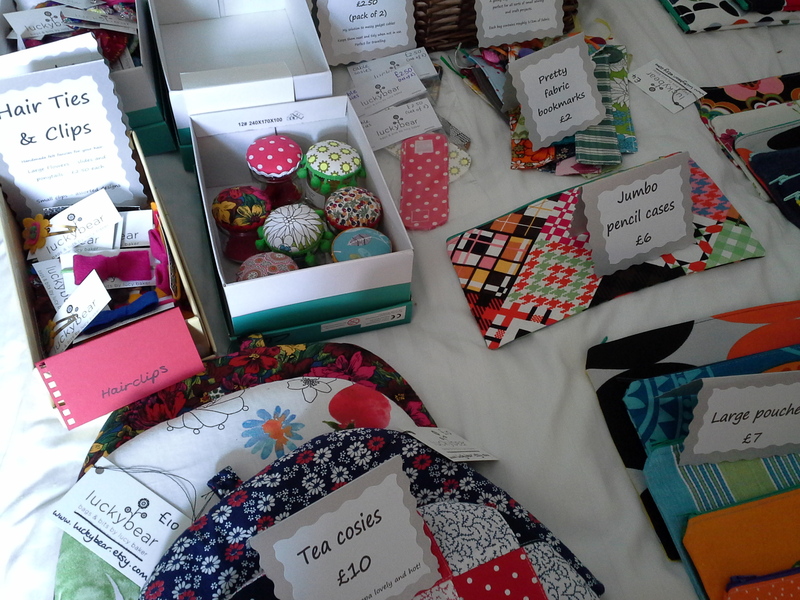 Other bits & bobs – brooches, hairclips, tea cosies, bookmarks and mini sewing kits. Jack Day 1 – this is why we are raising money – to help all the other babies like Jack. Jack now – nearly 5, full of beans and a lovely little lad. Thanks to the amazing NICU. A few months ago, I was pinning things on Pinterest. I came across this pattern in a search for “Sixties Dress”. Lovely, isn’t it? So anyway, I kept meaning to buy it to give it a go. But then a few months ago, I spotted it as the free gift on the cover of Sew Magazine! Haven’t bought that mag for ages (as I’d become a Mollie Makes fan). Really glad I did – it got me back into the magazine big style! It also seemed to match perfectly to the fabric I’d bought in my favourite little vintage shop here in Norwich – Junk and Gems. 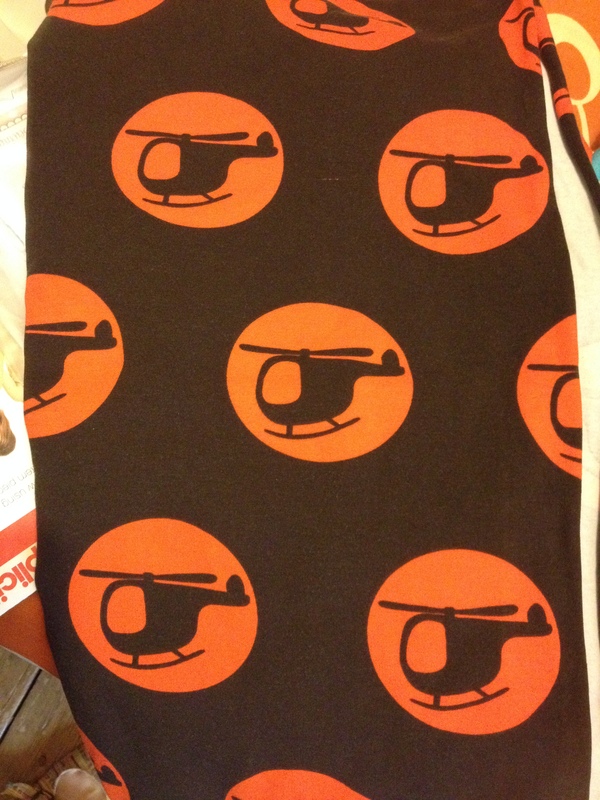 I think I bought this fabric for £12 for over 2 metres, which is a bargain as I love it so much. So, anyway, this was the next item in my ‘things to make for me’ list. 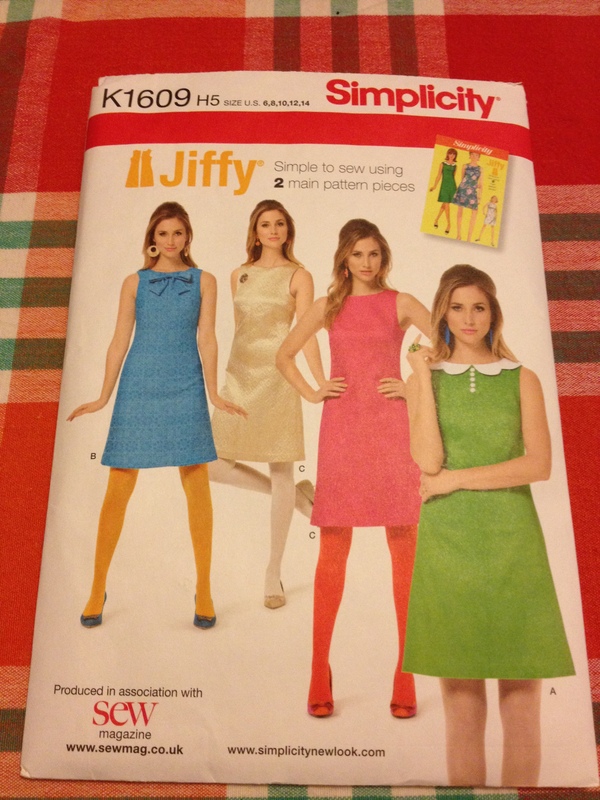 The pattern is from Simplicity – Ref number K1609 – and is called the “Jiffy”. 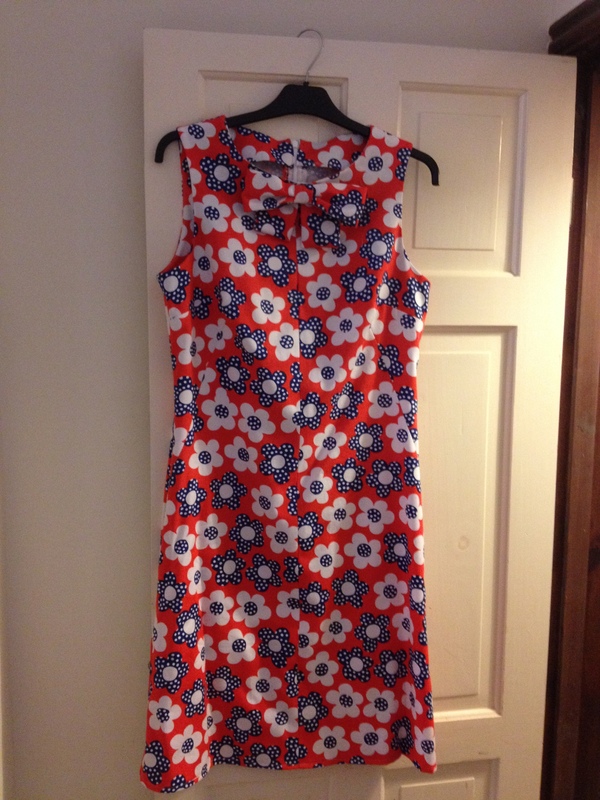 It was a pretty quick and straightforward pattern even for a novice dressmaker like myself and I’d recommend it to newbie sewers looking for a simple sixties style dress. I chose the view with the bow – it’s the blue dress on the cover – and set to work. Since making this dress, I have started to keep notes in my scrapbook about each project I make – partly to share with you, dear reader, and partly for when I make it again. And I will – it is a really cute dress and I am going to enjoy wearing it. 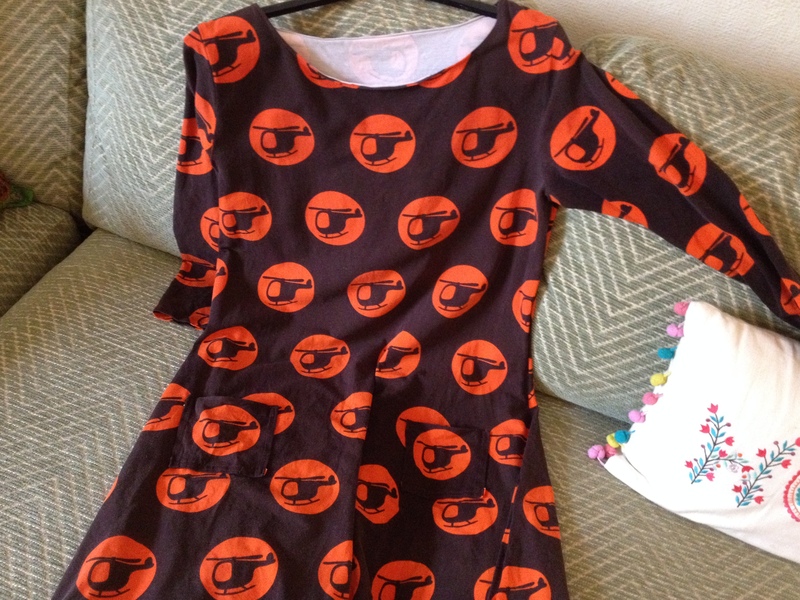 My sixties-stylee “Jiffy” dress, made indeed in a jiffy! 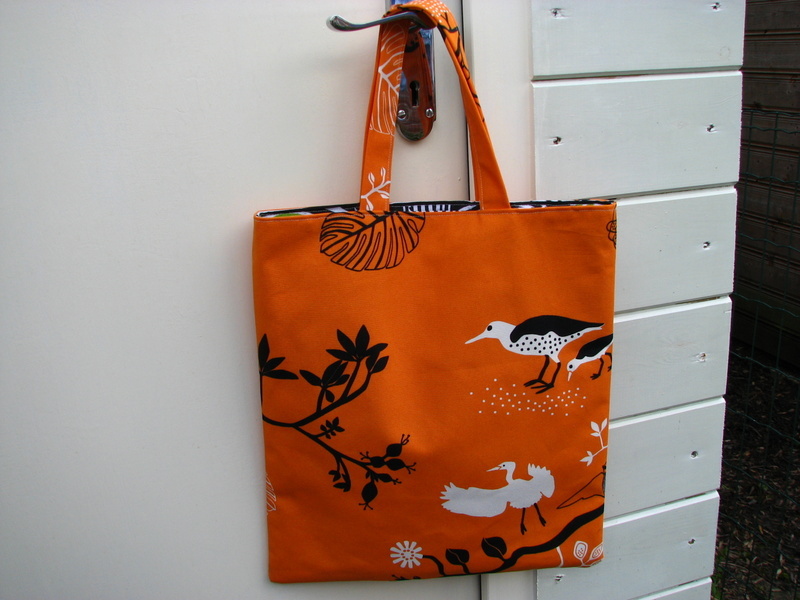 I highly recommend this pattern – it’s lovely, doncha think? Here it is: I’m quite pleased with myself! My notes in my scrapbook say next time, I would choose a fabric with a smaller print – although this is gorgeous, the way the pattern has you cut the front means that the print didn’t quite match up. A bit annoying, but a learning curve. I suppose had I followed traditional sewing advice and made a toile, I would have realised this, but I am not the most patient of people and actually for £12, I had nothing to lose really! I’d love to know what you think of it! Maybe once I lose the few pounds gained from a summer with a 4 year old eating fish & chips and ice cream at the seaside, I will post a photo of me actually wearing it. I really fancy another one – perhaps in a block colour with a cute little collar like the green one on the pattern envelope! Has anyone else tried the Jiffy pattern? Would love to see your photos! I do love making bags. Love it. But this summer (as well as keeping the bag-making going), I decided to give myself a new challenge and make some things for me to wear. Yup – actual clothes! I have made a couple of simple A-line skirts before, and a pair of pj bottoms (I do love my pjs and think you can never have enough!) but what I love about bags is, they don’t have to FIT anyone. So you don’t need to be uber-precise with cutting, etc. So, I thought I would step outside my comfort zone and give it a go. 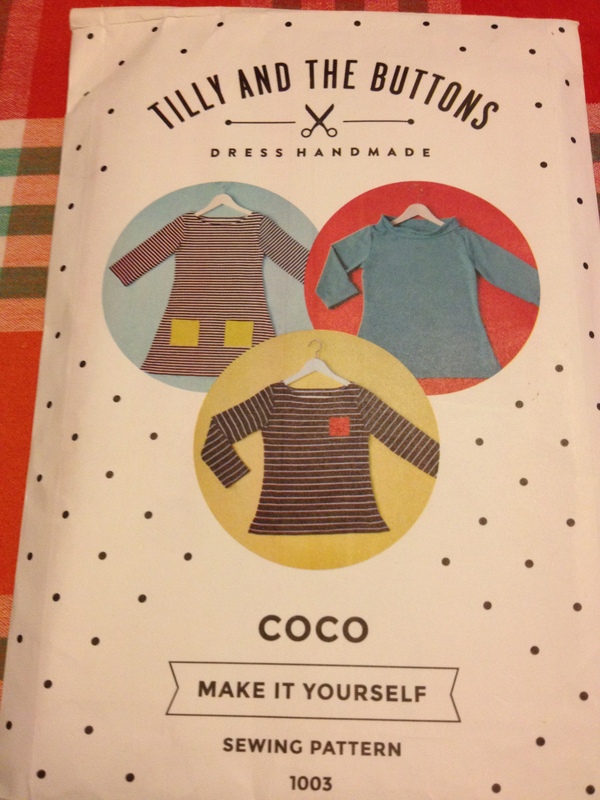 The first thing I did was purchase a pattern from Tilly & The Buttons: the Coco dress. I love Tilly’s blog and have been following her since she was on the Great British Sewing Bee back in 2013. Her blog posts are fun and helpful, full of good advice, but the best thing is that she explains everything really well for the novice dressmaker. If you want to try your hand at making clothes, you should get her book: Love At First Stitch. A lovely collection of patterns with great, detailed step-by-step instructions. Anyway, I ordered the Coco dress from her shop and chose some fabric and it was actually really simple. Her instructions are so good and clear and there are plenty of photos to show you what yours should look like! I have never worked with jersey fabric before so was a bit nervous but it turned out well and I’m really pleased with it. I have worn it loads, and it’s had lots of positive comments. It’s a slip-on dress with no fitted elements and it’s really comfy. I’d like to try my hand at matching stripes next to make one in Breton stripes, a la Tilly! The Coco Pattern. You can buy it from Tilly’s shop. I fell in love with this quirky fabric. Chocolate & orange – one of my favourite combinations! The finished dress. I love it. I then got the bug and decided the next thing should be a fitted dress! Having never ever made a dress before the Coco, this was a bold move on my part, to jump to something with shaping, darts and facings. It was scary! Luckily I had bought a gorgeous piece of fabric, then I discovered the perfect pattern and decided to dive right on in…you can see the results in my next post! Oh, but before I go, some exciting news to share. I have had one of my cosmetic pouches featured in an Etsy treasury this week – go have a look! Have any of you tried Tilly’s patterns? So, a few years ago I began to sew. I’ve always loved crafts and making things, and apart from a couple of small things I made at school (more years ago than I care to remember! 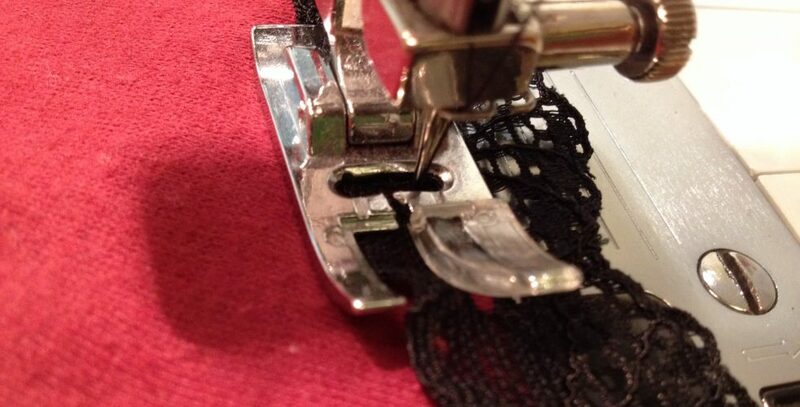 ), I had little knowledge of sewing. I bought a cheap, basic machine, signed up for an evening class and that’s where the passion was ignited! The first thing I made was a cushion cover, then a simple skirt and a bag. The first bag of many hundreds of bags that I have made over the years! I have to admit, I love bags. The first one I made was following a store-bought pattern and under the supervision of my sewing teacher. I still sometimes use it, years later. It’s not the best I’ve made but it was my first, so I love it. Well, once I had started making more bags, I realised that while I do love them, there is a limit to the amount one girl could use. Even someone who carries tons of stuff around, like me! So I began making them for presents. Then someone said “you should sell these” and so I did. I began by doing a couple of craft fairs and then signed up with Etsy. 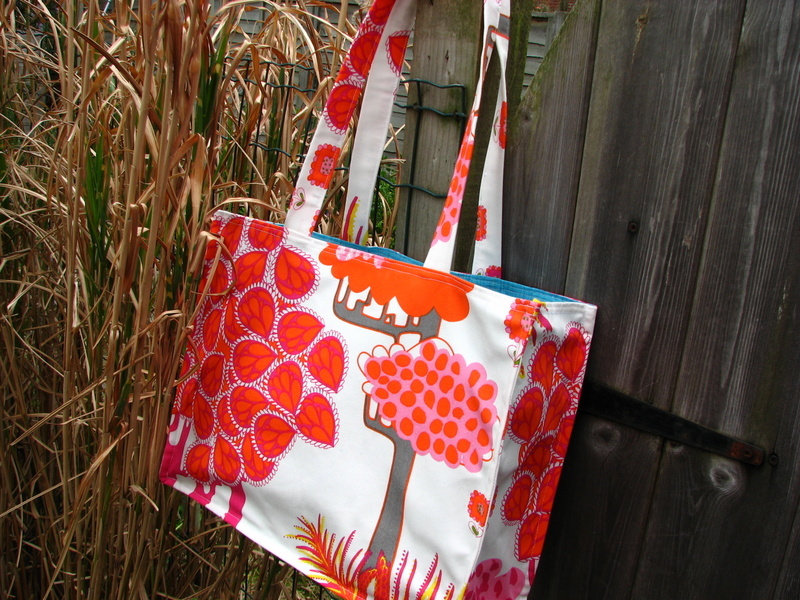 I now have an Etsy shop and it is so exciting when people like (and even buy) one of my bags. I have sent them all over the world. A book bag in one of my favourite fabrics. I LOVE orange – you will discover that about me! Love this print from IKEA. 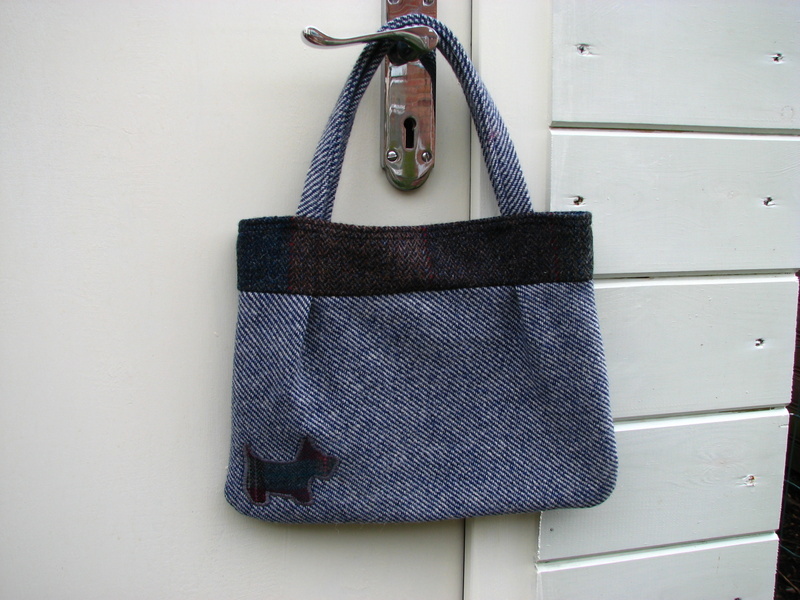 One of my tweed bags…with a Scottie dog motif.